Tulips are an indispensable item in your flower beds. Although they have been around for centuries, today’s tulips come in so many different sizes, shapes, and seasons of bloom that gardeners can have these tall, colorful flowers blooming from early spring right through May. These versatile plants blend well with other spring bloomers such as Virginia bluebells and they work perfectly when planted under groundcover like barrenwort (Epimedium) and periwinkle (Vinca). You can also create a classic combination by planting your tulips underneath Forget-Me-Nots. 1. Plant your bulbs in the fall. 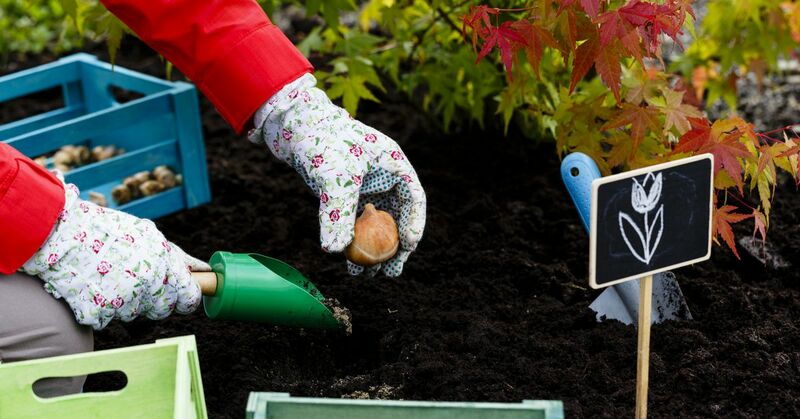 Plant them early enough (about 5-6 weeks before you expect the first frost) so they have plenty of time to establish roots before going dormant in the winter months. The time they spend in the ground over winter helps produce healthy foliage in the spring. Tulips do not like wet and compacted soil. Soil that drains well will have a positive impact on the vitality of your plants. Also, you probably already know this, but when you put your bulbs into the ground, remember that the pointed side faces up! Give your tulips enough room to grow. Bulbs should be planted about 5" deep and 5-6" apart if they're larger and about 3" apart for smaller bulbs. Unless you want to display your tulips like a row of soldiers, it's preferable to plant them in clusters. Too much water is the bane of tulips. While freshly planted bulbs will need water from you to activate their growth, it's probably the last time you'll do any watering. The bulbs and roots of tulips are vulnerable to disease and rot when they have an excess of water. Unless you're experiencing a prolonged drought, keep the watering can away from them. Aphids could be a problem, but they can be washed off with a hose. You might notice a plant with a spindly stem, along with white or yellow mottling and streaks on the foliage. It's likely that the plant has a virus, so dig up the bulb and destroy it. After the growing season ends, don't do anything until the foliage and leaves turn yellow and die. Then you can cut them back. This keeps energy in the roots and bulbs longer and ensures better health and growth next spring. Remember, tulips are perennials. If you give them the proper care, you can enjoy them year after year!